Many have difficulty in making dosa, especially beginners. 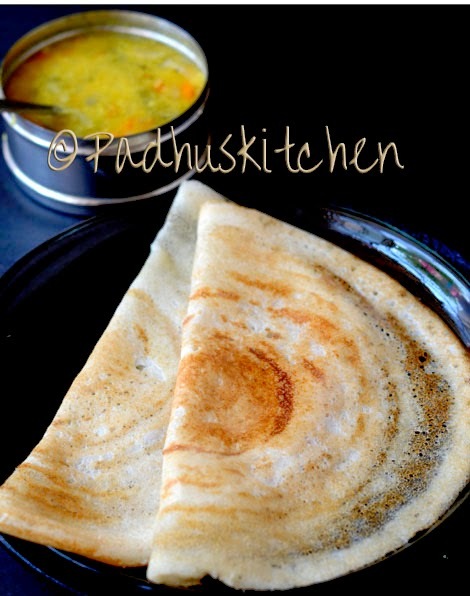 Today I am going to share with you few tips which I follow to make perfect dosas!! Once you practice, making dosa is very easy. Though I have both non stick and cast iron tawa, I personally prefer using cast iron tawa. I have given you few tips which I follow regularly to prevent dosas from sticking to the pan. 1.When you buy new cast- iron tawa, slightly heat the tawa, sprinkle salt on it and saute until golden brown. Switch off the heat. Once it cools, clean the tawa with a cloth, apply a light coating of oil and store it. This should be done when you buy a new cast iron tawa. Before making dosa, wash the tava well with water. 2.Try making omelet 2-3 times in it first, then make dosa. If you do not include eggs in your diet, then try making adai first. Once the cast iron tawa is seasoned well, it works wonderfully and making dosa is a breeze!!! 3.Before making dosa- Heat the tawa on medium flame, sprinkle some water, allow the water to evaporate, add 2-3 drops of oil on the tawa and rub the tawa with half an onion before spreading dosas. This prevents the dosa from sticking to the tawa and you can make olden brown, crispy dosas every time. 4.When onions are too costly, you can also cut the top portion of a brinjal or bottle gourd and use it instead of onions. Heat the tawa on medium flame, add 2 drops of oil on the tawa, rub/coat the tawa with oil holding the stalk of the brinjal/bottle gourd. 5.Bring the batter to room temperature before making dosa. 6.The temperature for making dosa should not be too high nor too low. If the tawa becomes very hot, sprinkle a little water on it to bring down the heat. 7.The dosa batter should not be too watery nor too thick. 8.Never wash tawa when it is hot. Once it cools, wash it with plain water and wipe it dry. If it is too oily, then use liquid soap and sponge to wash the tawa and wipe it dry with a cloth. Do not use harsh soap, plastic or steel scrubber to wash the tawa. 9.Use separate tawa for dosa and chapati. 10.When you buy iron tawa, buy thick iron tawas as they are good for making dosas and rotis. When you buy non-stick tawa, go for calphalon-a superior anodized product. Though it is a bit more expensive than teflon, it is much healthier. Do not use teflon coated non stick tawa, if the teflon coat peels/wears off. Hope these tips will help you to make perfect dosas!!! Reader can also post their tried and tested tips in the comments section. Love your blog Padhu! Thanks for these tips - I've been thinking of getting a cast iron pan again. My last experience with it was a disaster (I didn't know about the oiling/onion, etc.) Will try these tips with my next one. You have a fantastic blog here. Great work! How many days can I use bottlegourd top stick? For a day or two. Onion is best. If you do not have both, use a soft small cotton cloth (folded) to coat oil on the tawa. Hi Padhu, Can we season the Indalium dosa tawa also in the same procedure? Your method is not wrong but if the dosa sticks to the pan, you can adopt the tips above. If you are buying a new cast iron tawa or indalium tawa, you can try all these tips to season the tawa. hi padhu...m new to kitchen area bcoz i got recently married...i luv ur enthu and varieties in making so many recipes...i hope it ll be very useful for me...keep it doing!! Nowadays Pre-Seasoned Cast Iron Tawa Pan is being available. Any suggestion by you for the said tawa. I have decided now to put stop to nonstick tawa as within six months its out. Hi Padhu, I am trying to find one of these pans in the USA. Where would you suggest I buy one? I have been trying to make dosa in a cast iron pan with sides on it. It is very difficult to do. Thank you for any help. My friend is also looking for one. I have a iron tawa but i didnt use it for ,long time.now am dosa is sticking to that tawa..will the above tips solve my problem? Definitely it will help you. Hello: I am having trouble making dosas with a premade package mix. I am using a stainless steel pan that works fine for chapati but not dosas. As soon as the batter hits the pan it sticks. Should I buy a different pan? Oil did not work and makes things worse, sometimes these vegetable oils get sticky. Use a cast iron tawa or non stick tawa for making dosas. Keep that separately for making dosas. You should never use steel scrubber. You have to buy a new tawa for dosa. After use, wash it with warm water, wipe it dry, apply a thin coating of oil and store the tawa. Yes, you can but onion is more effective. ues salt and a little old heat to very hot and rub with Onion. Do no wash just wipe with a oily cloth for 2 or 3 times then you may rinse with hot water and oil with and oily cloth. Hi padhu, to remove rust on iron tawa. First I switched on the stove when iron tava get heated (medium flame). I sprinkled the salt and kept for10 mintutes on low flame .salt color not changed.so I switched off the stove and while removing the salt from iron tawa .I rubbed iron tawa with salt to remove rust and I applied the oil on iron tawa.tomorrow morning can I make dosa?whatever I done the process to remove rust is correct or not.please suggest me I need to buy another tawa. Apply a tsp of oil all over the tawa and leave it overnight. Then remove the rust with a cotton cloth and discard the cloth. Wash tawa with warm water and soap and wipe it dry.If there is rust in spite of all this, repeat the same process the next day also. Before making dosa, grease with a drop of oil and rub half an onion. When using iron tawa, wash and wipe it dry and then store it otherwise it will rust. Im a regular reader of ur blog and found it quiet useful. Cast iron pans are pre seasoned whereas ordinary iron pans are not pre seasoned. It is better to use 2 pans one for dosa and another for chappatis. I do not use my dosa pan for anything other than making dosa and toasting bread. Another pan, I use only for making chapatis. Where do you get cast iron dosa tava in bangalore? Please help me to buy cast iron tawa for making dosa. I don't know which one is good. You can go to amazon and read the reviews there to get an idea.Lodge cast iron pans are good but a bit costly. You will get good ones in local vessel shops, if you are in India. It will cost around Rs 500-600/- .Buy heavy ones. I have a question. In hotels they use a large stone platform (tawa) for making dosas... But why such stone tawas are not available for house hold usage? It will prevent rusting of Iron Tawas when use in houses, right? Rub salt and oil and leave the tawa for 2 days. Then wash it with sponge and soap. Then grease the tawa and make adai or omelet. After that you can start making dosas. It will not stick. Is Cast iron called vaarpu in tamizh, the thick ones? Hi Padhu, Greetings! My iron dosa tawa was great for almost 2 yrs but now the problem is the dosa batter is not blending well in the tawa. I thought there is problem with the batter and tried all possible ratios. But no use. Pls help me. Thanks! May be you should season the tawa. Clean the tawa with liquid soap and sponge. Wipe it dry.Coat with a thin layer of oil along with 1/4 tsp of table salt. Keep it overnight. Wash it again and use it first to make omelet or adai. After that you can make dosa in that tawa. Your dosa will not stick to the tawa. Hello Padhu! Kudos to you for maintaining such a great blog.. Really very useful for beginners like me.. And I really want to thank you for posting this dosa seasoning.. I got a new cast iron dosa.. But I was not at all able to make good dosa.. I was planning to buy a non stick new one.. This was a saviour.. I have few questions though..
1. Dosa came well in shape but was bit dry.. Is it ok to use oil liberally while we make dosa to avoid dryness like we do in normal iron tawa? 2. I followed the steps given in ur blog was making idli batter.. The thing is idli was soft.. But again the top crust was dry :-( though I applied gingely oil on the plate.. Wat to do to avoid dryness? 3. I don't use any metallic scrub to clean my pan.. But a soft sponge with liquid soap only.. After washing I still find that oil is not gone completely.. Looks like honey glazed.. How to remove that?? Tried vinegar, baking soda nothing worked..
1.Even when using cast iron tawa, you have to use oil for the dosa.Oil gives softness to the dosa. For softer dosas, you can make dosas like pancakes. (small and thick). 2.Try using a clean idli cloth for making idlies. 3. Wash with warm water using sponge and liquid soap.Then wipe it dry with a cloth. Do not use baking soda etc etc. Wash it with lukewarm water, liquid soap and sponge. Then wipe it dry with a cloth and store it. Your tawa will not be greasy. I bought a thandavala kadai..can i use the same procedure to pre season it..? Any iron tawa can be seasoned using the above method. Please help I washed the dosa tawa which was very hot. Dosas are not coming well . How to resolve this ? Never wash dosa tawa when it is hot. Always allow it to cool completely before washing it. As you have washed the tawa when it is hot, you are not able to make dosas. Not to worry. Follow this tip - apply a thin layer of oil with a little salt on the tawa and leave it overnight. Next day, wash it with warm water and wipe it dry. Continue this for 2-3 days. Then wash it with warm water and make omelet or adai first. After that you can use it to make dosas. The dosas will not stick. You can apply a thin coat of oil on the tawa regularly once in 15 or 20 days. I have a tawa that I use for chapati and I totally get it why to use a different pan for dosa. I have an extra heavy extra smooth 12 inch cast iron pan made by Finex in Portland Oregon. It is a general purpose pan but it seems to me that I could use for dosa. I haven't tried making dosa yet so I don't want to dedicate a pan. I'm hoping the extra thick beautifully smooth seasoned skillet will do the job. Thoughts? If seasoned well, you can definitely make dosas. I am dissapointed don't know what to do. Apply oil and salt and keep it overnight. Then wash it with warm water and make thick dosa or adai first. Start with adai or thick dosa, once it comes out well, you can make neer dosa. This was my second Cast Iron Tawa... One got already damaged because we made chappathi over that. Now it was the second cast Iron tawa.. yesterday I was frustrated, cos all of my dosa got spoiled..tried putting coconut oil, sunflower oil, rubbed onion.. there was no success. thanks for the tips... today i tried making moong chilla ... failed so miserably that i was crying.. can we use the dosa tava for moong chillas and omletes or should we avoid that ? If you follow the above tips, you can make anything from moong chillas to omelettes.Do not give up. Thanks for your tips on how to season a New Cast Iron Tawa. Followed the tips, outcome was fantastic. The first dosa turned out better than expected. Your other tips have proved helpful. Thank you very much. hi mam...could u plz suggest me how to remove thick grease on old iron tawa. Use warm water and liquid soap and sponge to remove the grease. If the tawa is old, you can rub tamarind, leave it for half an hour and then wash with warm water and soap.Then season it well before making dosas. Hey padhu I recently bought a iron tawa and was actually looking for a site where they will tell how to season but I didn't findm so I simply kept on stove...applied little oil and rubbed with onion...and washed it off. And againnrubbed some.oil and kept for couple of days.and by instinct only made adai...it came out well and after that dosas were like silk...it could be removed so easily. Today I found your blog...which actually shows similar method. Thanks. Can anyone please let me know which non stcky pan is good for paper dosas. I'm fed-up eating thick dosas. And I asked my parents to change the pan but they say the problem is with better.even after multiple different ratio's of batter. It didn't worked and again the same batter was tried in aunt's pan dosa came up like papper and crispy. Finally concluded it to buy good costly pan for only dosas. It depends on the batter and not on the tawa. You can make paper dosas on any well seasoned tawa. Add 2-3 drops of oil on the tawa and rub the tawa with half an onion before spreading dosas. The dosa will not stick to the pan if you follow the above tip. Hi. Very nice tips Padhu. So iron tawa is much better and healthier than non stick dosa tawa right? Yes, of course. Better than non stick. Hii... very thorough explanation above. THnx... But I am a beginner to cooking and have tried rice and semolina pancakes on my very old iron tawa after spreading oil with onion also, but still it sticks to the base and also for the same reason i have to make thick.. I was planning to buy a non stick tawa. Pls suggest shall i go for a non stick tawa or buy a new cast iron tawa.. Also pls let me know is there any difference in non stick tawas and dosa tawa ... as they are addressed by their respective names in websites. Cast iron tawa is the best when seasoned properly. You can use non stick but have to replace it every time the teflon coating comes off. Ordinary dosa tawa is without the non stick coating and non stick tawa is with the non stick coating. You can have both - a non stick tawa and a cast iron tawa. Is hindalium Tawa good? I have bght one for Chappathi. Should I season it before using? It will not be a problem for making dosas. I have not tried it for chapati. Season it well with oil and use it. It might take some time. What pan do you recommend for deep frying? Any tips to remove heat Scorch marks especially blue coloured marks on stainless steel vessels ? Thank you for these tips very handy. I have refers your blog many a times and love your energy for healthy food! Quick question, I made a red rice dosa batter with whole husked Urd. The dosa seem to be very sticky and uncooked. Why is this? I used 5:3 i have used this before with idly rice and split Urd dal. But this batter is so hard to cook. I later had to add ragi flour to rescue. Could you please help. Thank you for liking my healthy recipes. Please follow my Red Rice dosa recipe. You will not have any problem. How to clean hindalium tawa? It becomes dark after use. Try the above tips and see if it works. I am trying to use cast iron in Glass top electric hob. It's disaster. It's getting burned too quick.no luck even with low heat.quite disappointed though!!! !Any tips would be greatly appreciated.thanks in advance. Low heat does not work out. The heat has to be medium and constant. Hi, I have an iron tawa. The dosa doesn't stick to the tawa but it turns black only in the middle. Is there something wrong with my tawa? Maybe it has become worn out and has become thinner in the middle. Season it and try again following the above tips. If it does not help, get a new one. Please can you suggest which dosa tawa company is better ?? I use only locally available iron tawa. I also have a non stick prestige tawa. Iron tawa is available in all shops which sell vessels. If you season it well, it is as good as non stick tawas. kal dosai could not prepare well how to solve this problem? Problem with your dosa batter or dosa tawa. Season the tawa as said above. Hi Padhu,thank you for your post as im too worried about my dosa tawa.i have a indolium dosa tawa and it overheated after which i scrubbed using steel scrubber.i have been pouring kanji(my mom s way of greasing new tawa) on it everyday and still sticks.What do you think i could do to fix this? You can season indolium tawa in the same process mentioned above. I suggest thick iron tawas for making dosas. If you season it well and take good care of it, it works like non stick. Hi padhu... iam regular to your site. Ur presentation is extremely good. i have a non stick tawa. some how my dosa seems to be very dry. what is reason for that. Thank you for liking my site. Too much heat or too less oil could be the reason for dosa to be very dry. Though I have cast iron tawa, I prefer my locally bought iron tawa. Follow the above steps. Make omelet or adai first.Use only sponge to clean your dosa tawa whether it is iron or non stick. cast iron tava ,how to season it before 1st use? First time heat it, apply oil all over with a paper towel. Once it gets heated well, turn off the heat. Once it cools, wipe off the oil and store it. Then you can start using it. Follow the above steps if you have trouble making dosa or omelet etc. Hii..after how many months / years should one typically replace a non stick tawa? We are using one from aug 2016, does it need to be replaced? You can discard the non stick tawa when you find the non stick coating starts to come off. If you use it with care, it will last longer. I had bought prestige cast iron tawa. Used it .Without seasoning dosa not s trucking but is like becoming brwon and looks like batter color only. Some where it s not like regular dosa. Sometime then I fried onion, one day's it was slightly fine but again it started same way as whitish dosa.